This is your chance to win £50 worth of vouchers and more… and for just a few seconds of your valuable #freefrom time you would be doing me a huge favour. Read on to find out how you can reward all the hard work of a humble freefrom blogger (that’s me!) for a lot of hard work raising awareness and blogging about all things freefrom, allergy and anaphylaxis. You could help What Allergy make history and become The Best Freefrom Blog 2015. And like I said, not only will you get a lovely warm feeling for having voted for you bestest most favouritest freefrom blogger (me again! ), there are also some GREAT prizes to be had. 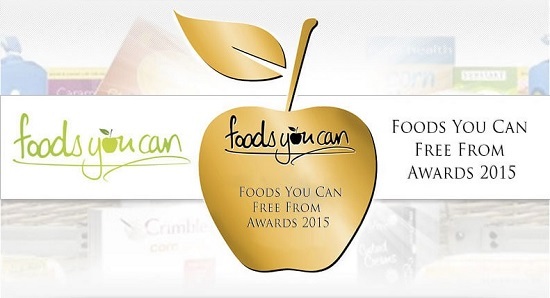 The Foods You Can Free-From Awards™ are chosen by popular vote* via the free from food community. It doesn’t matter who you are, you can place your vote and help to decide which brands deserve to be the WINNERS. This year we’re expecting thousands of you to take part and cast your votes. Each person only has one vote so get involved and make it count. By getting involved and casting your vote, you’ll also have a chance to WIN a range of fantastic free from prizes. Each person that votes can** be entered into a free prize draw to win one of three prizes. A £50 food shopping gift voucher for the supermarket of your choice. free-from food hamper with goodies worth up to £50. VOTING is now open and ends on the 25th of October 2015. *Only one vote can be placed per person. **Voters can opt out of being entered for the competition. I won this award last year. Can I defend my coveted #bestfreefromblogger title? Can I win this for a second year running? Please don’t assume that just because this is such an awesome blog that I won’t need your help… I’m up against some pretty brilliant fellow bloggers. I would vote for some of them if I wasn’t so competitive myself. The line up of FreeFrom bloggers is pretty impressive this year so the competition is going to tough. I’m going to the awards ceremony this year too to present one of the other awards so it would the icing on the #totallyfreefrom cake to win again. And if you love freefrom food and actually do eat it yourself, you can also vote for your favourite #freefrom pasta, cake, biscuit, food on the go, restaurant etc. to name just a few. It’s just an honour to even get shortlisted so every company here has been vetted and analysed by the Foods You Can panel of judges.